Laura's story is an unusual one. One week she was feeling stuck at her job in a nightclub, the next she was cycling alone on her first-ever bike tour... through Iceland. Laura's now pedaled over 12,000 miles through a handful of countries, both solo and with cycling partners. Her adventures have given her a unique perspective on fear, gender and adventure, which we explore more deeply in her next interview, "The Phantom Man." Laura said she feels a deep joy in moving through new landscapes, and that "this joy is both felt and stored in all my cells." Laura’s now pedaled over 12,000 miles through a handful of countries. Where do you live, and what role does your bicycle currently play in your life? For the last nine years I've lived between the United States and Latin America, mostly in Massachusetts, Rhode Island, and Costa Rica. My bicycle is my adventure-mobile, and every couple years it takes me on a trip somewhere around the world. I've cycled around Iceland, from Alaska to San Francisco, across Colombia, across Ecuador, around Costa Rica, and most recently from Labrador to Rhode Island. What inspired you to try bike touring? I was twenty-one years old and working in a nightclub. The place was dark and thumping, and smelled like sweaty dollar bills. One evening I stood there in my fake eyelashes and high heels, surrounded by drunken chaos, and realized it was time to go. When I got home that night, I opened my laptop and looked for cheap flights to anywhere. I bought a ticket for the following weekend, to Iceland. Then I had to figure out what I was going to do when I got there. I had a bike, so it occurred to me to try cycling. I bought panniers, learned how to box the bike, and packed my camping gear. The next weekend instead of going back to the club, I boarded a plane to Reykjavik. The plane landed at two in the morning, I built the bike in the airport, and then just biked out into the arctic dawn. Over the course of a month I cycled around the whole island, and camped each night wherever I landed. I had done no research, so everything was a surprise—icebergs, glaciers, puffins, and massive waterfalls all just appeared before me out of nowhere, dreamlike. I fell in love with the shifting landscapes and the freedom of motion in new places. 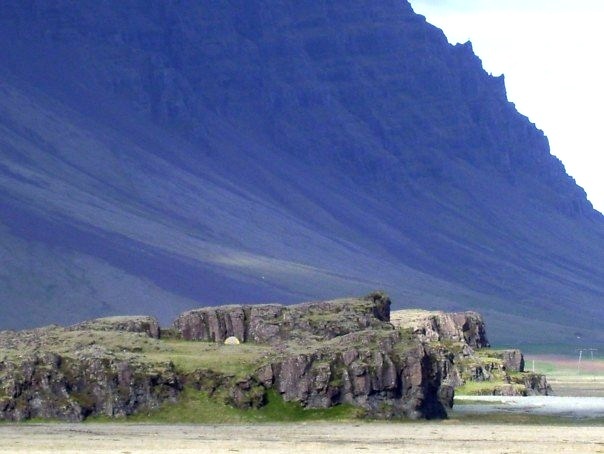 As I wrote this today, twelve years later, I decided to check my old emails to see if I had saved any more information about the Iceland trip. I found just one message, to myself, from myself. It was the flight verification with a single word typed at the top: “AHAHAHAHAHAHAHAHA!!!! !” I guess that's what I was thinking at the time I bought the ticket. What surprised you about bike touring? I think the world becomes more friendly when you travel by bicycle. People everywhere are interested in what you're doing and where you're going, and they want to help you. In Ecuador, a four foot woman carrying a sack of guinea pigs invites you home for dinner; in Colombia a man in a market smiles and hands you an unidentifiable fruit; in Canada a family takes you in for the weekend so you can watch them perform in a local theater troupe. The kindness of strangers, from all walks of life, is dazzling. How did you fall in love with cycling? I think I’m still falling in love with cycling! I've biked (somewhat haphazardly) over 12,000 miles around the world, and there's still so much to learn and experience. Cycling pulls me into long, protracted moments of time, some of which I remember vividly, and some of which just drift away. It’s really the experience of being there that I love. I can't imagine ever giving it up, for any reason. What did you learn about yourself while cycling? Cycling has taught me a lot about how much I love my body. I love the feel of being in motion, gliding through new landscapes, breathing in and out and going forward. I love the freedom of independent motion. I feel a great joy in moving through natural places, and I believe this joy is both felt and stored in all my cells. What are some of your favorite touring memories? A few years ago I set out on a long cycling trip across Colombia with a lovely Frenchman I had met at a concert a few weeks before. Our bikes were true clunkers—I had bought mine used for fifty bucks, and his was a similar quality. Our gear was a mishmash of old duffel bags, a child's rolling backpack, and bungee cords. We may not have been fast, but we were stylish. About midway through the trip, we rolled into Medellin and turned onto a street in the center of town. As far as I could see, the sidewalks were packed with hundreds of people, their faces all turned to us, watching. Suddenly I realized what was going on—we had accidentally entered the last leg of a bike race, and we were in the lead! I sat back on my bike seat, raised both arms in the air, and yelled in triumph. At once, the entire crowd raised their arms with me and cheered! My friend and I rode the whole length of the street pumping our arms in the air, the crowd clapping and hooting on all sides. It’s the only bike race I've ever been in. Moments like that—completely unexpected and unpredictable, hilariously absurd, and shared with people you'd never otherwise meet—are a hallmark of long cycling journeys. You just have no way of knowing what's around the bend, and that's what makes it so fascinating. Laura develops farm-to-table food systems for small farms and permaculture centers around the world. Every year or two she disappears into the wilderness on long cycling and hiking trips. Laura's articles on food, permaculture, adventure, and gender have appeared in various magazines, newspapers, and blogs. For recent blogs on food and permaculture, please see the Round the Bend Farm website. You can follow Laura's adventures and connect with her on Instagram @laurakillingbeck.